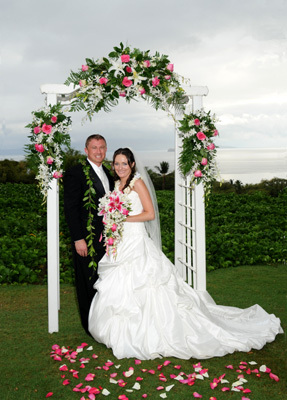 Although the State of Hawaii has outlawed most chairs and archways on beaches, you can still have that beautiful archway decorated with your choice of fresh flowers on Maui... just not on a beach. There are plenty of private locations where we can arrange any sort of wedding decorations you wish. This archway was set up on the private grounds of the Seawatch Oceanview Lawn. Just ask your wedding coordinator for locations where you "Can, have it all". Called #2 because there is no real name for this very small secluded beach. Located to the South side of the Makena Surf condominiums in Makena. A small private parking lot for 4-5 cars is accessed through a gate on the South end of the Makena Surf property. A short paved pathway leads you to the smallish beach which is surrounded by lava rock. This is a very secluded location for small groups who want the most private location. This is a great location for sunsets year round. A permit is required.